Photo by PicselPerfect, CC BY-NC-ND 2.0 Savannah is a delight to the senses. 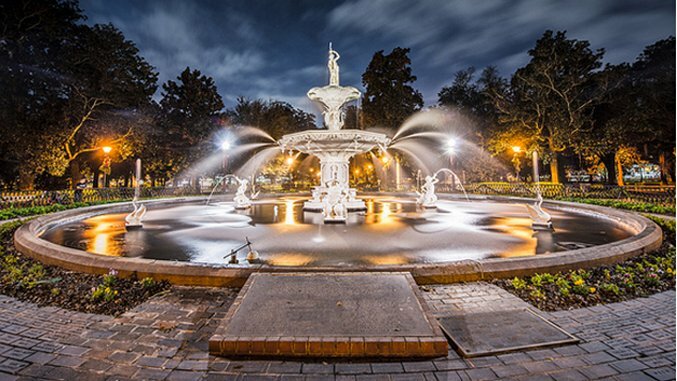 The city is visually stunning with its trees dripping in Spanish moss, thriving art scene, and abundant squares and parks surrounded by stately old mansions. The best way to experience the city is on foot and hand-in-hand with your significant other. Work up an appetite walking the Historic District and pack a picnic lunch to share in Forsyth Park (pictured). The City Market, dubbed "the art and soul" of Savannah, also offers plenty in terms of eating, shopping and entertainment. Photo by Kelly Hau, CC BY 2.0 Think hot air balloon tours at sunrise, candlelit bistro dinners, quaint bed and breakfasts, and of course, copious amounts of wine. For all these reasons and many more, Napa Valley makes for romantic travel. As one of the world's premier wine regions and with more than 400 wineries, the trip is especially perfect for oenophiles. Don't miss the private (see: romantic) balloon flights and champagne breakfasts from Napa Valley Balloons, Inc., hot springs at Calistoga Spa or one of the tours on the ever-popular Napa Valley Wine Train. Photo by Daniel Cruz, CC BY-NC-ND 2.0 With its warm weather, beaches, culturally-rich neighborhoods and thriving night life, Miami lends well to carefree travel. Plan on getting plenty of sun and eating well. The city is famous for its Latin American and Caribbean cuisine, dubbed Nuevo Latino, and a food tour is a great way to experience it. Miami has no shortage of diverse districts and attractions, from Little Havana to South Beach. The latter is perfect for couples looking for a livelier Valentine's Day. Photo by EttocL, CC BY-NC-ND 2.0 Outside the revelry of Mardi Gras, New Orleans is a city with an intimate sort of liveliness. There are the packed jazz joints hidden away from the more frequented neighborhoods, a culinary scene that tells the history of the city through a melting pot of many influences and flavors, and a culture that is as rich as it is unique from any other city in the country. It takes only a little exploring and time, whether by street car, carriage ride or on foot through the different neighborhoods, to get a sense of New Orleans. Walk the French Quarter, tour the grand plantations along Great River Road and absolutely be sure to eat crawfish etouffee, jambalaya and beignets before imbibing at one of the city's many music halls. Photo by Alistair Nicol, CC BY-NC 2.0 This famous South Carolina seaport destination is rich in history and has plenty to offer traveling lovebirds. A horse-drawn ride through Charleston Historic District from Palmetto Carriage Works is a must, as is a visit to the 65-foot-tall Angel Oak Tree that is believed to be between 500 and 1,500 years old on nearby Johns Island. Take a sunset walk past the old mansions and moss-covered oak trees in The Battery before grabbing dinner. We recommend one of the city's raw or seafood options like Hank's Seafood Restaurant or Coast Bar & Grill. Photo by Gregg Jaden, CC BY-NC-ND 2.0 As far as big cities go, you can't get more romantic than New York. The options are endless, albeit admittedly touristy. Plan a wintery carriage ride or stroll through Central Park, a visit to the top of the Empire State Building for your Sleepless in Seattle moment, and if you're really looking for the wow factor, a helicopter ride over the city is a must. Photo by Stefan Klopp, CC BY-NC-ND 2.0 As the United States' own slice of paradise, Hawaii needs little explanation of its merits as a romantic destination. Maui, with its scenic highways and postcard-perfect beaches, is among the state's best offerings. Picture cruising down Hana Highway, also called the Road to Hana, a picturesque drive that includes hundreds of hairpin turns and takes you by rainforests, waterfalls and black sand beaches. While Hawaii is a pricer destination compared with travel to the contiguous states, Maui is the ideal destination for couples looking to splurge on romance. Travel makes a great gift for any occasion. Experiences, after all, are invaluable compared to other tangible commodities. You can’t put a price on broadening your horizons through the exploration of unknown places, especially when shared with someone you love. Memories of past travels will be with you for life, long after other items have been lost, broken or grown tired of. With Valentine’s Day just around the corner and falling on a Sunday this year, Paste is here with seven romantic getaways better than any bouquet of roses or heart-shaped box of chocolates. From sunset wine tours in Napa Valley to late night dancing in Miami, these destinations are perfect for a long weekend jaunt in the name of love.